And then I started arguing with my mother on Facebook. Good times. But like I say, there is always something to be grateful for, and by God, I will find it! After the long holiday weekend I am thankful for QUIET. The kids went back to school yesterday, but it wasn't until today that I got to be alone. I ended up pretty much taking a "mental health day". That's a thing, right? Velcro has made it possible for us to put off teaching AJ to tie shoes for nearly 7 years. However, he needed sturdier, lace-up shoes. We're working on it. I am grateful for patience. 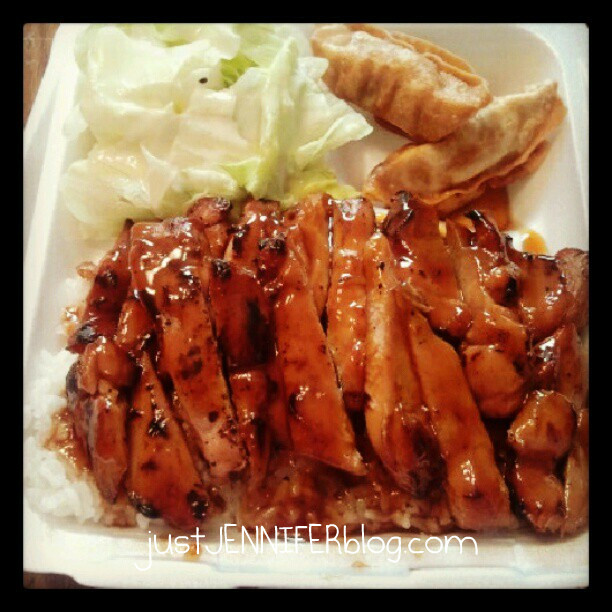 I am thankful for the deliciousness that is my favorite teriyaki and their $5 lunch special! Regardless of what I said above, I am so very grateful for my sweet husband who, although utterly bewildered by my emotional state, which by the way is exacerbated by being on a birth control pill (I mean, I am putting EXTRA estrogen into my body! ), just gave me hugs. Yes! You are allowed a mental health day! You have a lot on your plate. I'm glad you got a hug from Mark. That chicken teriyaki looks awesome!